Listeners Call For Tougher Reporting On 'Alt-Right' Movement After Pollak And Spencer Interviews : NPR Public Editor Pleas for a different approach to reporting on the "alt-right." In this August 2016 photo, Stephen Bannon, then-Republican presidential candidate Donald Trump's campaign chairman, attends Trump's Hispanic advisory roundtable meeting in New York. Bannon is the former CEO of Breitbart News, an online news site that he previously called "the platform for the alt-right." Happily, from my point of view, the language NPR used to describe Bannon and the movement evolved quickly away from just "alt-right." As standards editor Mark Memmott wrote Monday in an internal memo, "additional words are needed because many in the audience either have not heard of it or aren't sure what it is." The views of the alt-right are widely seen as anti-Semitic and white supremacist. Most of its members are young white men who see themselves first and foremost as champions of their own demographic. However, apart from their allegiance to their "tribe," as they call it, their greatest points of unity lie in what they are against: multiculturalism, immigration, feminism and, above all, political correctness. The AP says this: "The so-called alt-right — a movement often associated with far-right efforts to preserve 'white identity,' oppose multiculturalism and defend 'Western values.' "
His advice concluded: "'White nationalist' is the most concise description," and the NPR newsroom seems to be following that directive. In a series of subsequent interviews, NPR has explored exactly what the movement is (and it should be noted that Bannon gave a just-published interview rejecting some of these ideas.) Media correspondent David Folkenflik did a reported piece for All Things Considered, and a deeper online story, and discussed the topic on Here & Now. On Morning Edition, Steve Inskeep conducted what I found to be a contentious live interview with Joel Pollak, senior editor-at-large for Breitbart News (some found it not contentious enough). And on Thursday's All Things Considered, Kelly McEvers interviewed Richard Spencer, a white nationalist who coined the term "alt-right," but the interview itself did not air live. The Morning Edition and All Things Considered interviews, in particular, prompted several hundred complaints to NPR, most along the lines that NPR was "normalizing" hate speech. 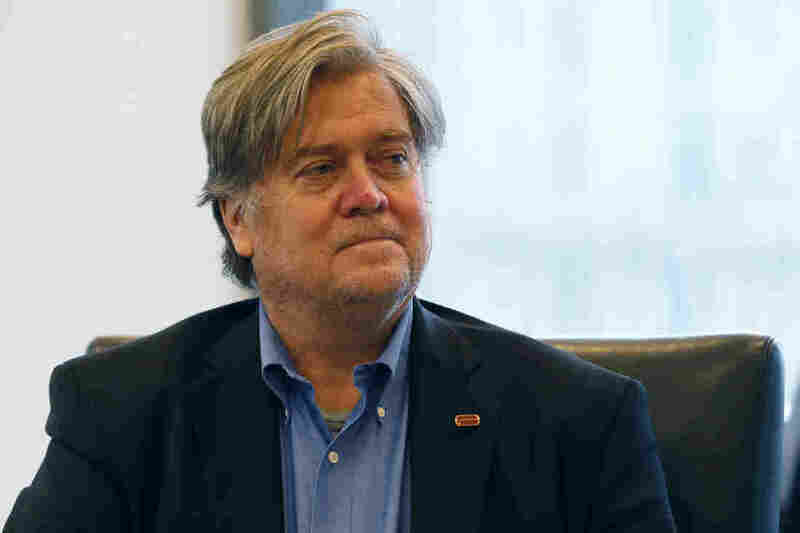 "I am deeply concerned and disturbed by Morning Edition's story about Breitbart News and Steve Bannon. The opening..."Let's hear a defense..." was so offensive as was the tone of the entire story. There is no defense to bigotry. Bigotry is not an opinion or partisan. It's a form of hate." "I suspect you will get hundreds, if not thousands, of email messages concerning the segment "'We're Not Going Away': Alt-Right Leader On Voice In Trump Administration" piece that aired today. I certainly hope you are inundated. While I appreciate McEvers' careful, and repeated, acknowledgement of the fringe white supremacist (what she calls "nationalist") views expressed, I was appalled that NPR effectively legitimated such views by interviewing someone suspended from Twitter because of his hateful rhetoric and beliefs. While it is obvious that President-elect Trump's campaign has given such men a higher platform for their abhorrent and clearly dangerous views, I do not think NPR has to pander to them. Quote them if you must, report on their rise and organizing strategy and followers — but interview them as if they were any other figure of importance? That only entrenches their growing power further. This is beyond "balance." "I am writing to express my concern about Kelly McEvers's interview of Richard Spencer on the Nov. 17, 2016 episode of All Things Considered. I first want to say that I appreciate the program's attempts to contextualize the interview, but the interview itself seemed far too normalizing of hateful rhetoric. Both Richard Spencer and his "think tank," the National Policy Institute have been profiled by the Southern Poverty Law Center. While Spencer's words themselves are pretty damning, not enough was done to emphasize that this is a recognized hate group. This is also concerning in light of how Steve Inskeep approached the interview with Joel Pollak on the Nov. 16, 2016 episode of Morning Edition. These two interviews together go a long way to normalizing white supremacist ideologies and normalizing hate speech. I'd like to see more pressing journalism that questions how recognized hate groups and extremists can have the ear of the President-Elect and a place in his administration." Those who write my office tend to be critics, although Eric Schwartz, of Williamsport, Md., wrote to us: "I wanted to thank All Things Considered and Kelly McEvers for her interview with Richard Spencer on Nov. 17. It is essential that the people of the nation know more about the White Supremacists. Spencer's talk about racial homelands may be chilling, but the public should know about these views and the fact that these people were key supporters of Donald Trump. I urge NPR to continue to shine a light on an ideology that was so central to the candidacy of Mr. Trump. This ideology may play a critical role in shaping policy of the Trump administration." NPR also posted the Spencer interview on its Facebook page, and the reaction in the comments was much more positive. Wrote one person: "I really appreciate All Things Considered covering this. Please do everything you can to report on who these people are and what this movement actually represents." More listener reactions aired on Friday's All Things Considered. I asked the newsroom for a response to the outpouring of criticisms and got back a short statement from Michael Oreskes, NPR's top newsroom executive, which seemed to refer only to the praise: "I'm glad that NPR listeners understand why it is so important that we bring these voices to attention. We cover the world as it is. It is our duty to present difficult and even unacceptable points of view if they are driving thinking among voters or policy makers. We work hard to set these voices in that context." Here's my take. NPR is not the only news organization to have conducted such interviews in recent days. The New York Times did, the Dallas News did and the non-NPR-affiliated public radio program Reveal did, to name a few. There is a difference in the way the audience perceives written pieces and hearing them on the radio. Broadcast interviews come across as giving the interviewees, any interviewees, a "platform" to spread their ideas, to employ a term many of the critics of these interviews have used. That makes framing such interviews all the more important. Unlike many of those who wrote to my office, I'm not going to dissect the two interviews question by question, but I will make a couple of points. I think the framing of the Morning Edition interview was problematic, starting as it did with "Let's hear a defense of Steve Bannon." I don't believe NPR ran the interview for reasons of "balance," but because, as Oreskes says, it's NPR's role as a news organization to bring to light and scrutinize even the most difficult currents of society. (I would give the same response to the handful of people who have written my office saying these interviews showed NPR's liberal bias, because they were contentious.) But when framed as a defense, listeners will not hear it as a probing interview. In addition, in my opinion, these interviews should not be done live. Inskeep is an excellent live interviewer, but live interviews are difficult, especially when there is limited time. A little contextualizing never hurts. It worked for the Spencer interview, to my mind, and NPR also did the same this summer with Inskeep's interview with David Duke, the former Ku Klux Klan leader who was then running for U.S. Senate in Louisiana. The Duke interview drew similar criticisms, but I defended it, partly because I thought it was put into context well. My broad takeaway? I know the many listeners who wrote will disagree, but I believe there should be no topic off limits for NPR, and that it is important to hear from people directly, so one can know exactly where they are coming from. But going forward, when tackling such deeply serious topics, NPR needs to pay absolute attention that the questions asked are rigorous, the headlines and framing well thought through and the language very clear and precise from the beginning.